Need more apps for your favorite device? iOSnoops can help! Here are 58 iPhone, iPad and iPod touch apps that have just gone free. 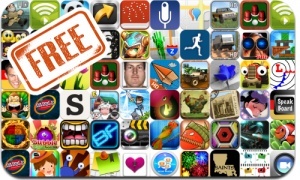 This apps gone free alert includes Snail Break, Dabble, AirAV, Fruit Go, Kingdom Story, HungrySquid, Spellsword, Barnyard Mahjong, Flight Control, Bubble Birds 2, Graffiti Me, and many others.